Are Leeds United Still Masking The Reality? By the end of October we will have seen enough masks to last us a lifetime, or at least until Halloween 2019. Over at Elland Road, we are still waiting to see if the ‘real’ Leeds United will suddenly reveal itself. You know, the one we have a strange, dysfunctional and distinctly one-way relationship with. Last month I wrote about the next block of six games and whether Leeds could see the month out just as they started it; on top of the table. Despite a brief blip over the weekend, as I write, Leeds have just beaten Hull City to go back into first spot. And yet many media people, rival fans and, let’s face it, even many Leeds fans are still convinced the mask will slip and Leeds will capitulate into mid-table like they always do. Except this time it all looks and feels a little different. We now have a better points total than we did at the same stage last season, but admittedly it did for a long time carry an uncanny resemblance to the stunning start that Thomas Christiansen hoodwinked us with a year ago. That of course was built on sand, and it crumbled away into nothing pretty quickly. While Leeds have suffered their first league defeat in the last month, results and performances since have done everything to convince us that was just a minor hiccup along the pathway to the stars. Included in that have been two local derbies away from home; games in which Leeds routinely fail to rise to the hype that the home team manage to build. In such games you can set your watch by when certain things will happen; the home crowd are up for it, the players who have been mediocre in every other game this season are up for it, Leeds concede before half-time and never manage to get a foothold back in the game. From Barnsley to Rotherham and from Sheffield United to Bradford City we have all seen it so many times in recent years. But in the last two games Leeds have drawn 1-1 at Sheffield Wednesday after going behind and won 1-0 at Hull City. There is an element of frustration that Leeds haven’t won both games, but the key thing is that Leeds were able to control both games and were never once muscled out of their stride or intimidated by a home crowd baying for blood. At all times Leeds kept their shape, stuck to a well-drilled pattern of play and just did their own thing. This involved scoring two goals that included front-to-back passing movements featuring virtually the entire side, and culminating in a searching finish from distance delivered with devastating aplomb. There has been some criticism that Leeds aren’t scoring the scrappy goals that their creative play is presenting on a plate, but the goals they are scoring are all beautifully crafted and bear the hallmarks of a team that is organised, has a plan and is supremely confident. All this has been achieved without the services of key players of course. We haven’t seen Pablo Hernandez for over a month, and that’s way too long. Pablo was injured prior to the Middlesboro game at the end of August, and when we were also dealt the significant blow of injuries to top scorer Kemar Roofe and £7million signing Patrick Bamford, you feared the worst. Now Leeds just need to ride out one more fixture before a two-week international break, after which the side should be blessed once more with at least some of this craft and firepower. 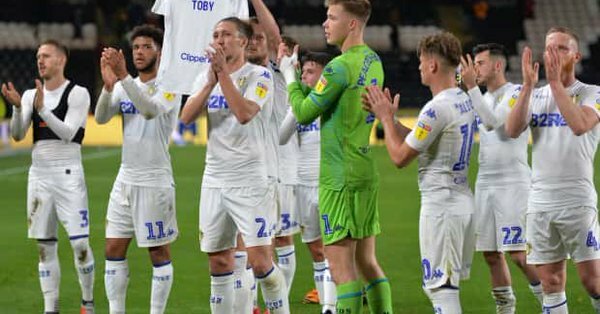 That Leeds have managed to stay up there and to play some of the football that they have, during this period, should tell everyone exactly what they need to know about the character and endurance of this team, but still there are doubters. Personally, I don’t mind that. If Leeds have to go into every game having to prove themselves to people, then that isn’t a bad mind-set to have. The day we get complacent and believe all the hype is the day that standards drop and mistakes creep in. So let’s hope that people are still questioning the quality and longevity of Marcelo Bielsa’s side in April with just two games to go and with Leeds sitting pretty and with their destiny in their own hands. We have seen just the two home games at the Peacock during September, within four days of each other and each with very contrasting emotions. Preston North End arrived on Tuesday 18th and were brutally put to the sword, as an injury-ravaged Leeds crushed them 3-0 with a display that oozed with style and buoyancy. It could have been much more and set everything up perfectly for the visit of Garry Monk’s Birmingham City on the following Saturday. Of course the football world is littered with pantomime villains where Leeds fans are concerned and Monk is definitely in that league now, and if there’s one game we didn’t want to lose it was this one. I guess that it was written in stone that Leeds would succumb to their first defeat in this game and we should perhaps be thankful that it wasn’t Millwall away, but it was hard to take all the same. October brings three home games, in another stop-start month punctuated rather rudely by those pesky international breaks. We have the visit of Brentford this Saturday then no games for a fortnight. A short trip to Blackburn is followed by the visit of lowly Ipswich Town on Wednesday 24th and then a Saturday evening Kick-Off against Nottingham Forest on the 27th. This last fixture is the kind of game we look at when planning things at the Old Peacock and everyone kind of goes quiet and starts to contemplate what it will be like. You won’t be surprised to learn that even though the game kicks-off at 5.30pm rather than 3pm, that doesn’t mean people come to the pub a minute later than normal. Certainly not Leeds fans anyway. We will be licking our lips at the potential bar takings, but it does also present a few challenges throughout the day. But it is all the fun of the fair and we wouldn’t have it any other way. When Leeds United are flying like they are now, our job is just to keep the good times going, and we have plenty of years’ experience of doing that. So let’s see where Leeds are in another month’s time. Hopefully the mask hasn’t slipped yet and the real Leeds United is becoming more recognisable as the one that is still cutting a swath through this division.